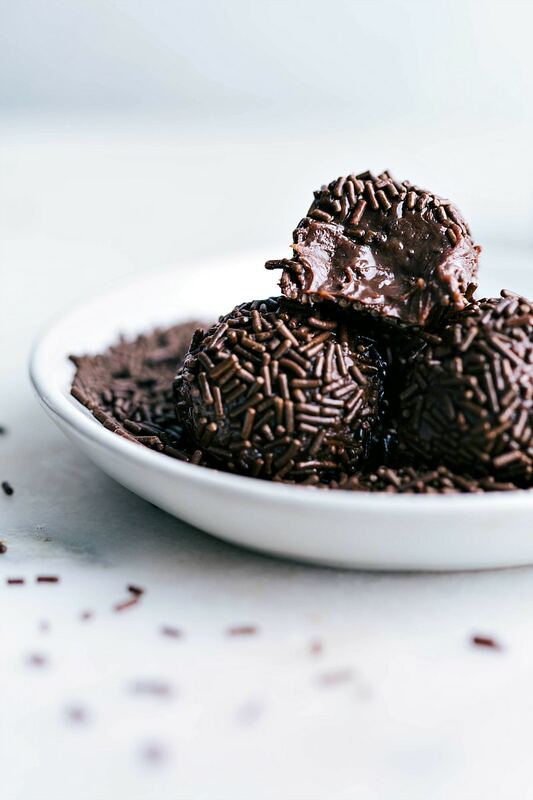 Ultra chocolatey and fudgy brigadeiros — a traditional Brazilian dessert made of sweetened condensed milk, cocoa powder, butter, and chocolate sprinkles. This candy is simple to make and sure to be a hit with whoever tries them! 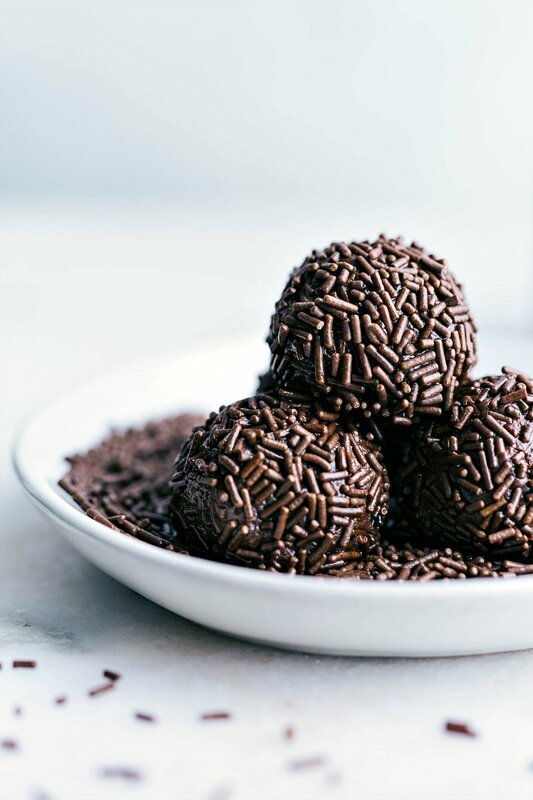 These brigadeiros are simple to make, but require a bit of planning since they do need some chilling time! They’re a great make ahead treat, transport well, and make a beautiful addition to any party or holiday spread. My mom spent a few years of her childhood (and then returned as an adult) in Brazil. She still speaks perfect Portuguese and has made us brigadeiros and limonada brasileña (brazilian limeade) ever since I can remember. Those were some of our two favorite treats growing up! We loved sitting over the stove stirring the brigadeiro dough with her and then rolling the fudgy balls in chocolate sprinkles (stealing bites of the dough and handfuls of sprinkles of course). So today I’m sharing my mom’s brigadeiro recipe that came her friends in Brazil. I’ve added a pinch of salt to balance the sweet and enhance the flavors, but other than that, this is the recipe we’ve eaten and enjoyed for years. A brigadeiro is a traditional Brazilian delicacy. It’s made of sweetened condensed milk, butter, cocoa powder, and sprinkles covering the outside layer. Brigadeiros are a staple in Brazil and can be eaten with a spoon straight from the pot, which is by they are often called “brigadier de colder” (spoon brigaderio). 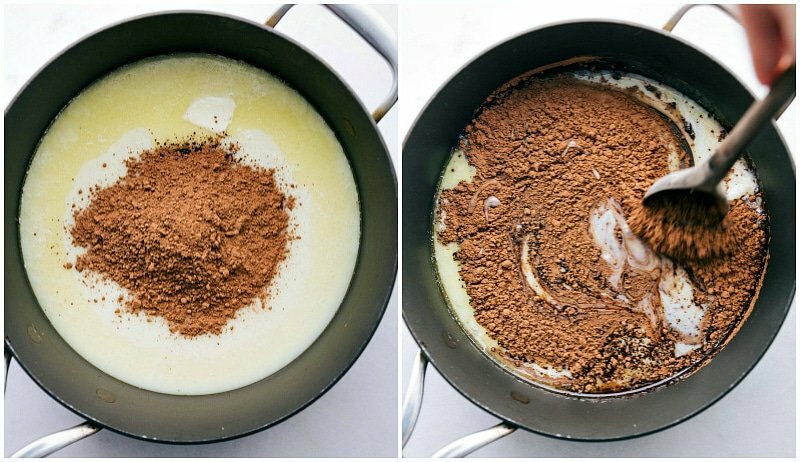 Trust me you’re going to be stealing spoonful from these brigadeiros. Does Brigadeiro need to be refrigerated? Yes! Immediately after cooking the brigadeiros they need to be placed in the fridge for at least 30 minutes. Once those initial 30 minutes are up you want to remove them from the fridge, roll them in balls, dip them in sprinkles, and then put them back in the fridge to harden a bit more for an additional 15-30 minutes. After that they are ready to be served/eaten. I like to keep any left over brigadeiros in the fridge. They can keep in the fridge for up to 12 days and unrefrigerated for 7 days. Brigadeiros freeze great for up to 3 months. If you have any leftovers or you want to make them ahead of time just make sure you have already rolled them in the sprinkles, and then keep them in a plastic airtight container with the lid tightly closed in the freezer. 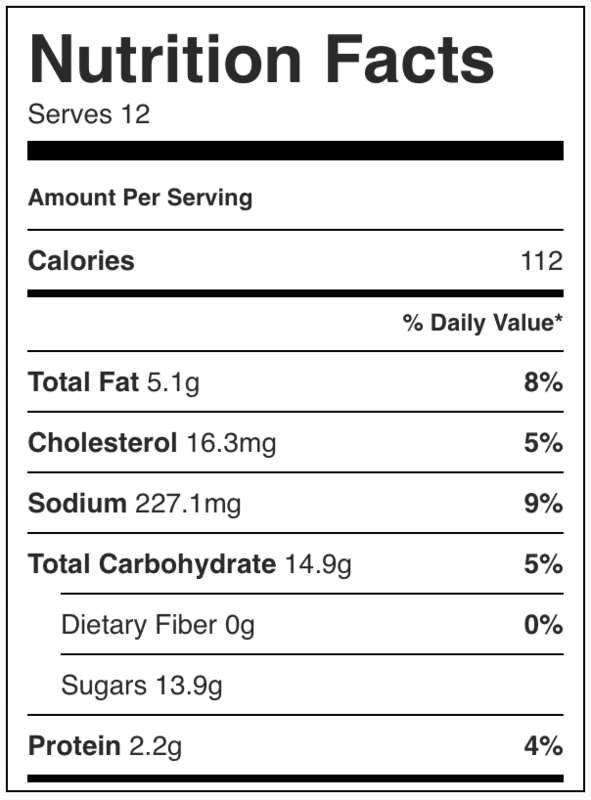 How many calories are in a Brigadeiro? There are 40 calories in each of these Brigadeiros. This batch of Brigadeiros make 12. 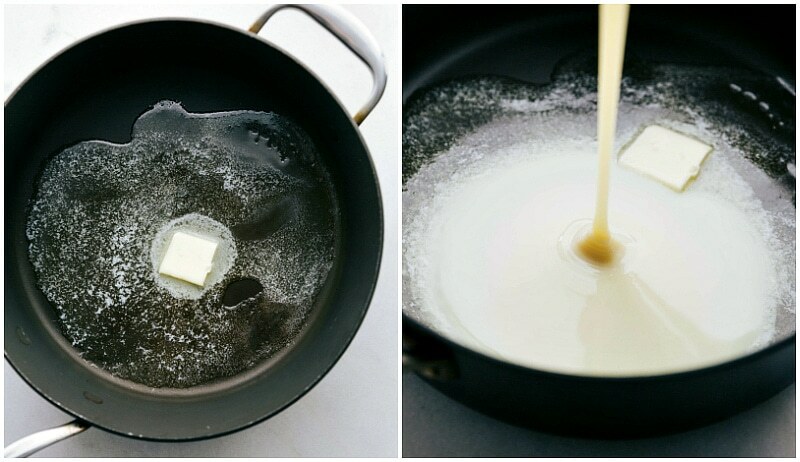 Soften 1 tablespoon butter and rub it over a large plate. Set aside. When mixture is set, butter your hands to prevent sticking, and pull off a portion of the mixture (about 1/2 to 1 full tablespoons). Roll the mixture between your hands to get a perfectly round ball. Repeat with the remainder of the mixture to get about 12 balls. Pour sprinkles (or cocoa powder) on a flat plate and roll the fudge balls into the sprinkles (or cocoa powder) to coat. You are so sweet thank you Megan! These are so perfect for spring!! I kind of love that they are strawberry and not chocolate…adds a fun twist to things. That’s how traditional brigadeiros are supposed to be 🙂 Thanks so much Taylor and thanks for the pin! So cute! These look amazing 🙂 Perfect for spring! While I’ve never heard of brigadeiros, I’m pretty sure I would eat the entire bowl! Love anything strawberry and the sprinkles are so fun! Love the strawberry essence. Can’t wait til there here fresh and local. Brigadeiros. Now that’s a fun word to say! And I think you’re super cool for getting the chance to live in Brazil for a bit!!! Looks like a great recipe! Chelsea, this is so lovely. Isn’t it cool how travel and other people can impact your food? These look wonderful, and they are coated in sprinkles. Say no more 😉 Thanks for sharing a special, unique recipe! I’ve never head of Brigadeiros! And also have no idea how to pronounce it 🙂 They do, however, look insanely delicious! I love love brigadieros. This strawberry version sounds incredible! Haha, well I can’t say it, let alone try to spell it, so all I’ll say is WOW! These are so cute and the thought of pink taffy rolled into balls with sprinkles sounds amazing! I bet I would eat the whole batch, popping one after another into my mouth. Pinned! I’ve never heard of these, but anything with sweetened condensed milk calls my name 🙂 These are so cute! How smart are you? I love the Nesquick strawberry powder! Pretty perfect for spring! These are wonderful Chelsea! This is such an interesting recipe!! And really only two ingredients?! That’s crazy! The texture looks amazing and they sound so delicious. Plus I love how you turned them into a great Easter treat! So cute! What a fun recipe and so pretty too. My kids love anything round, chewy, sweet, and sprinkled so this would definitely make them happy. Pinned. Would love to share this on my weekly roundup. My Tia ( who was born and raised in Brazil) used to make Brigadeiros when she lived here in the U.S. She had given me her recipe but I miss placed it. My Tai now living in back in Brazil is hard to get a hold of, that is why I have been searching the web for a good Brigadeiro recipe. I must say she never made chocolate or any other flavored Brigadeiros, I remember making them with her, she simply used sweetened condensed milk and butter, after chilling the heated mixture in the freezer over night, we would roll and cover the candies with chocolate sprinkles. I am not sure why she didn’t use cocoa in the mixture but i’m ok with that. My family and friends all loved the simple little candies. I would love to try your version of the recipe thank you for sharing it! 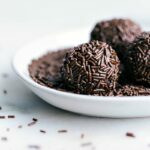 I know brigadeiro all too well… I am from Brazil and have been making them for years! They are a staple in any celebration. My daughter loves them and always ask for them in her birthday parties. My American neighbors and her American friends always expect them whenever there is a gathering. Brigadeiros have become quite famous and are being made in a variety of flavors now, there are even some gourmet recipes that are to die for. Anyway, I have been looking for a good strawberry brigadeiro recipe for valentine’s day, and this one is a champ! The one I am used to make, requires strawberry powder, the real thing, which makes the candy more tangy and less sweet. But this ingredient is hard to find and is somewhat expensive. So the way you have it here seems to be the perfect alternative. Thank you so much! Oh my gosh I’m OBSESSED!!! Your card couldn’t be any cuter 🙂 I love it and thank you so much for sharing!